This online lesson introduces learners to the Impact-Based Forecast and Warning Services approach to managing risk from weather events. After reviewing the steps of the approach, learners will practice using them in two simulations. In the simulations, learners must determine the likelihood and potential severity of weather hazards associated with an approaching storm. Then they must create a message describing the potential risk and impacts from the storm's most prominent hazards. Use the steps for filling in a warning template and compiling an Alert Warning to craft effective messages focused on communicating the potential impacts of a hydrometeorological event. 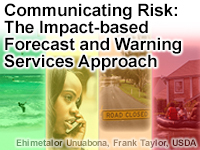 impact-based forecast and warning services, risk, managing weather risk, communication, simulation, response table, severity of impacts.